My family makes the 3-hour drive down to the mountain town of Fernie in Southern British Columbia at least once every winter from Calgary, but up until this year, we'd never left the ski hill. 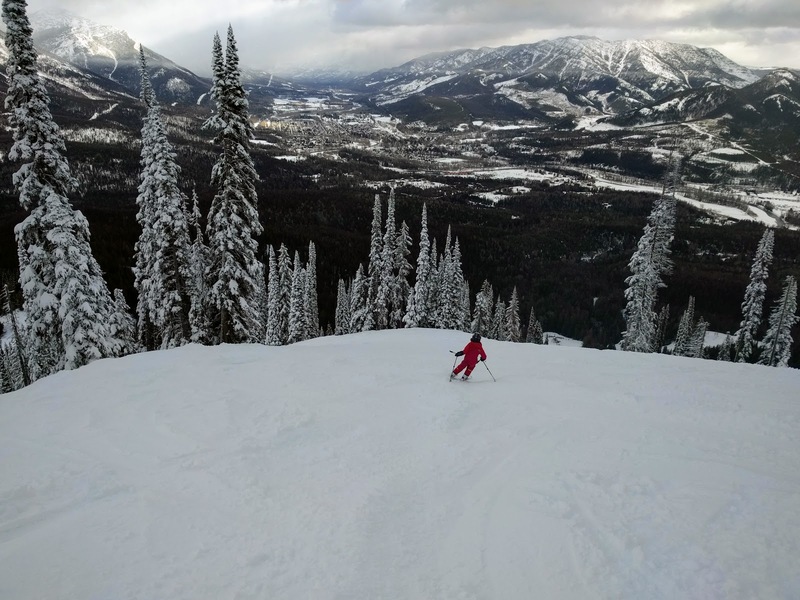 And while Fernie Alpine Resort is an amazing ski hill (one of our favourites,) Fernie has so much more to offer in addition to downhill skiing! 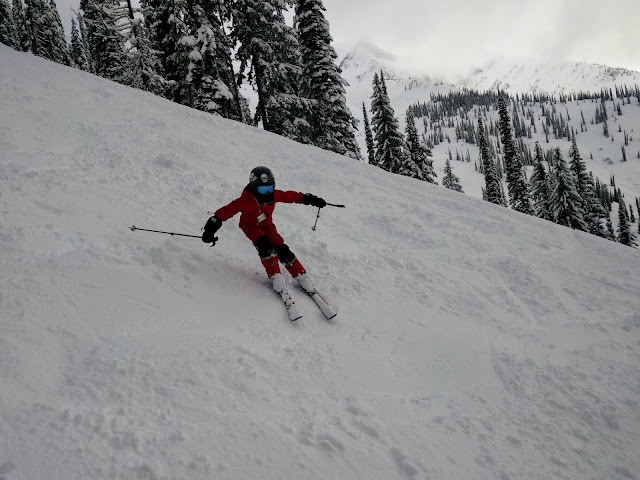 I would never suggest you to go Fernie and skip skiing at Fernie Alpine Resort (because that would be crazy talk for any dedicated ski family,) but we added a couple of extra days on to our annual Fernie trip this year so we could check out the other destinations around town. We wanted to try some new activities and explore the incredible trail network we enjoy so much on our summer visits. We've visited Island Lake Lodge in the summer (when the road is open for visitors to drive up for the day) but it's a completely different experience in winter when the lodge goes into full backcountry mode, and is accessed by snowcat only. Spa treatments are also available (for an additional fee) and snowshoes can be rented if you want to hike around the lake. Alternately, bring your own snowshoes or cross-country skis for use on the trails around the lodge. We brought our own skis because we wanted to ski out from the lodge. Return transportation is included with every package, but we thought it would be fun to enjoy the descent back to the parking lot on skis following the Cedar Valley Trail that is groomed by the lodge. Can you ski or hike up to the lodge? Yes, you can, but you need to make a reservation ahead of time for lunch, and it would be hard to predict an arrival time. If you choose to pursue this option, give yourself plenty of time in case the trip takes longer than expected. It would also be quite the slog up on skis (much more fun on descent) and I would not recommend it with children as the trail gains approximately 500 metres of height gain. Do we have to make a reservation for the snowcat tour? Yes! You'll also choose your departure time in the morning and your return time in the afternoon when you make your reservation along with your lunch reservation time. Can we pay for a one-way ride down on the snowcat if we ski or hike up? No. All snowcat tours are a return package deal and include lunch. Can we rent skis at the lodge? No. The lodge only has snowshoes to rent. Bring your own cross-country skis if you want to tour around the trails near the lodge. Can we stay overnight as a family? No. All overnight stays are part of an all inclusive 3 or 4 night cat skiing package. There are no nordic packages for families. Does the lodge have snowshoes to rent for children? Yes they do. If you have to choose between snowshoeing or cross-country skiing around the lodge, choose snowshoeing. The trail around the perimeter of the lake is a snowshoe trail. Meanwhile, the lakeside ski trail does a loop that is further away and you won't get views of the lake while on it. Ask if your kids can take turns riding in the front of the snowcat with the driver. (one on the way up and one on the way down.) My son got to ride up front and loved the experience. Visit the Island Lake Lodge website for more information on the snowcat lunch tour or if you want to make a reservation. 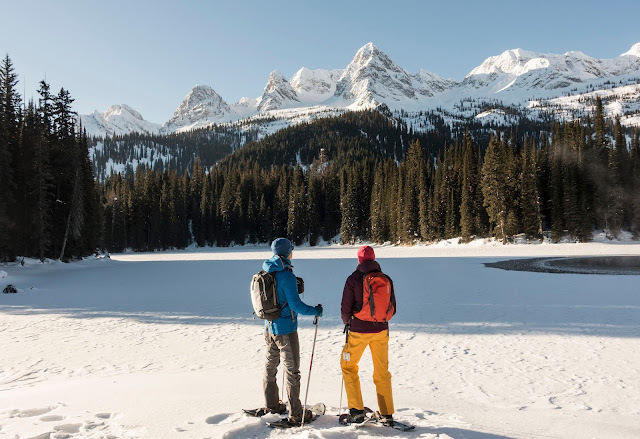 Fernie's multi-use trail system extends across five different mountain areas, connecting onto the Island Lake Lodge trails and even connecting Fernie Provincial Park with the Fernie Alpine Resort. We set aside a day on our recent trip to Fernie to explore the Montane Trail Network because we love mountain biking here in summer. We used our cross-country skis to reach the Montane Warming Hut on the Montane Green Trail and enjoyed seeing familiar trail markers from our summer bike rides. The Montane Green Trail is a groomed 8km cross-country ski loop and I'd estimate that we gained between 150 and 200 metres of height skiing up to the hut. - and personal recommendation, take the upper (more gradual) trail on your way up to the hut, descending the lower (steeper) trail. - There's a good map here that also has the parking lot marked beside the bridge on Coal Creek Road. For non-skiers, you can also enjoy the Montane Blue Trail on either a fat bike or on foot. This trail also climbs to the warming hut and is one of our favourite mountain bike trails in summer. - find the trail on the map above. Read more about the Montane and Multi-use Trails here on the Tourism Fernie website. And you can see a giant winter trail map here showing all of the areas around Fernie that can be explored in winter. Finally, looking for more options for a winter hike or want to pull out the snowshoes? Check out this great resource on Snowshoeing in Fernie by Tourism Fernie. Fairy Creek Falls were on our list for our recent trip until the temperature plummeted on our final day and we chose to head home earlier than planned. And for those wanting to try some easy fat biking, I recommend touring the main town loop. We were fortunate to get free bike rentals with our stay at the Snow Valley Motel but there are shops in town where you can rent a bike for a day as well. We love skiing at Fernie Alpine Resort and in previous years we've always spent our entire weekend on the hill. If you family likes downhill skiing or snowboarding you can read my previous guides to see why we love skiing at this resort so much. Ski days at Fernie Alpine Resort are magical! 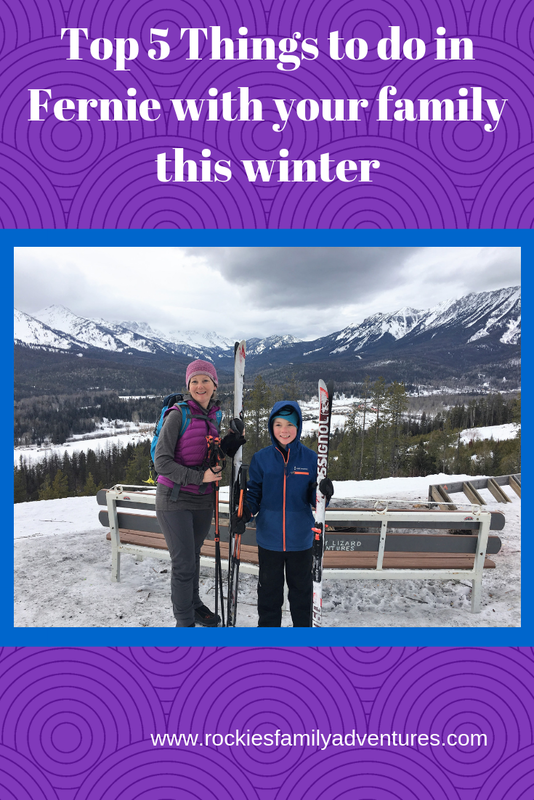 We enjoyed skiing on the Montane and Island Lake Lodge Trails, but if you're looking for track setting (not just grooming,) the Elk Valley Nordic Centre in Fernie is the place to go! I actually skied down to the Nordic Centre trails from Fernie Alpine Resort one afternoon (which is an amazing option for those staying at the resort in the ski in/ski out lodging. I skied the Galloway Loop, down the Grunt, around the Cedar Loop, and down to the warming hut in an easy 5.5 km outing. It took me roughly 1.5 hours and my husband picked me up at the warming hut when they were finished skiing at the resort. - See a trail map here. Read more about the Elk Valley Nordic Centre here along with other areas around Fernie where you can enjoy cross-country skiing. Fernie has a new NHL sized outdoor hockey rink located right beside the aquatic centre. It's the perfect place to spend an hour in the afternoon after skiing with a soak in the giant hot tub inside the aquatic centre after. We love the Fernie Aquatic Centre for its hot tub, swimming pool with diving board and waterslide, and inflatable toys that come out once or twice a week. There's also a great shallow pool for younger kids. Thanks also to Island Lake Lodge for hosting our snowcat lunch tour so that I could include their magical destination in this guide. As always, all words and opinions are my own and we were not compensated in any other way other than accommodations and our tour to Island Lake Lodge. Find it ALL at Panorama Mountain Resort!